Also known as	abdominoplasty, a tummy tuck removes excess fat and skin, and in most cases restores	weakened or separated muscles creating an abdominal profile that is smoother	and firmer. 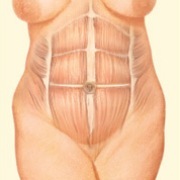 A flat and well-toned abdomen is something many of us strive for through	exercise and weight control. Sometimes these methods cannot achieve our goals. Tummy tuck surgery is a highly individualized procedure and you should	do it for yourself, not to fulfill someone else’s desires or to try	to fit any sort of ideal image. Although the results of an abdominoplasty procedure are technically permanent,	the positive outcome can be greatly diminished by significant fluctuations	in your weight. For this reason, individuals who are planning substantial	weight loss or women who may be considering future pregnancies may be	advised to postpone abdominoplasty surgery. Tummy tucks are not a substitute for weight loss or an appropriate exercise	program. Also, tummy tuck operations cannot correct stretch marks, although	these may be removed or somewhat improved if they are located on the areas	of excess skin that will be excised, generally the treated areas below	the belly button. Medications are administered for your comfort during abdominoplasty surgery. The choices include intravenous sedation and general anesthesia. Your	doctor will recommend the best choice for you. 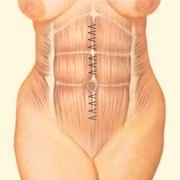 A full tummy tuck procedure requires a horizontally-oriented incision in	the area between the pubic hairline and navel. The shape and length of	the incision will be determined by the degree of correction necessary. Through this incision, weakened abdominal muscles are repaired and sutured	while excess fat, tissue and skin is removed. A second incision around the navel may be necessary to remove excess skin	in the upper abdomen. Your abdominoplasty procedure will result in a flatter, firmer abdominal	contour that is more proportionate with your body type and weight. The final results may be initially obscured by swelling and your inability	to stand fully upright until internal healing is complete. Within a week or two, you should be standing tall and confident about your	new slimmer profile.